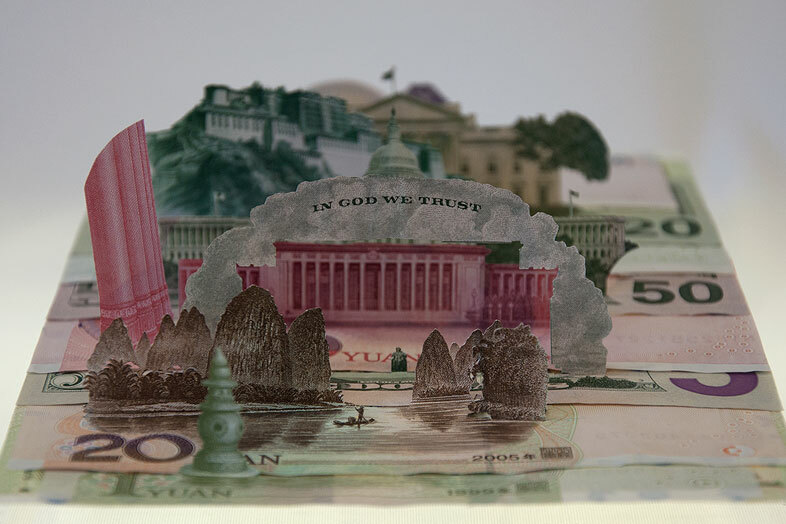 As a cross-cultural study, Moneyscape I is a response to my early experiences of the world as a series of images printed on paper bank notes. The pop-up sculpture presents a real object transformed by the hand into an imaginary landscape. 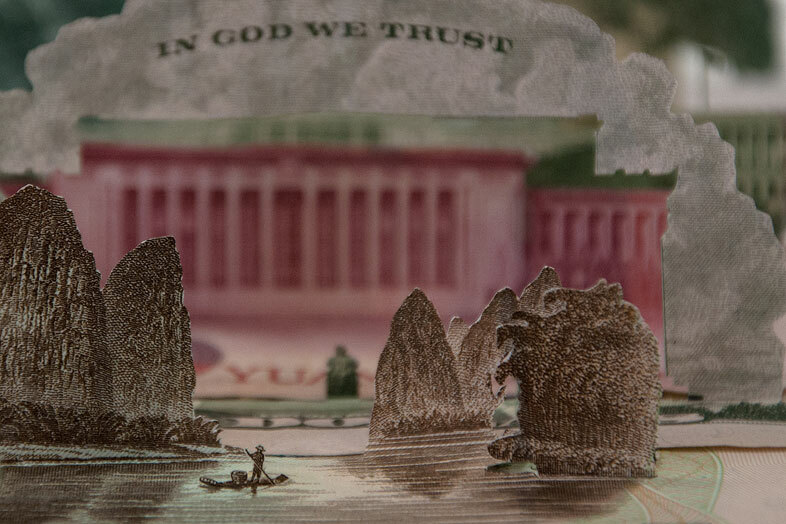 The deconstructed, engraved images of political and financial houses interspersed with picturesque natural landscapes romanticise the abstract concept of monetary ownership and power. 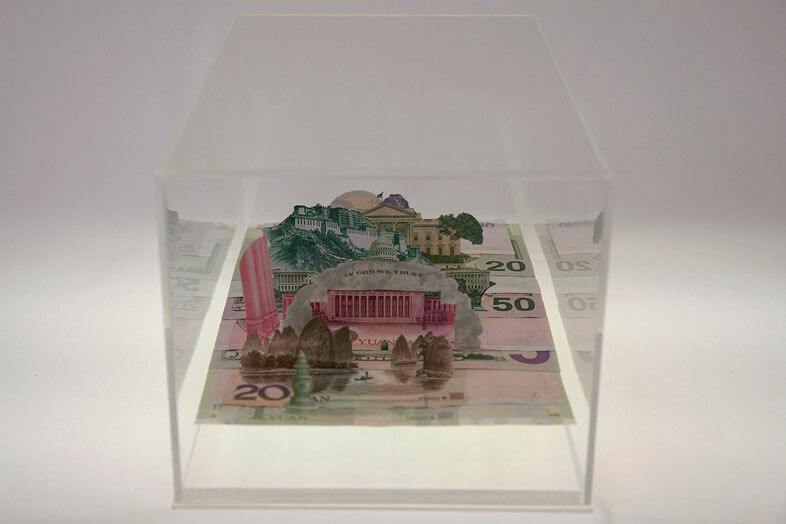 However, beyond this, money also has infinite temporal dimensions that connect human narratives, histories and place. An artist, freelance designer, and independent curator, Abdullah M.I. Syed was born in Karachi, Pakistan (1974). Presently he is completing a PhD in Fine Arts practice and lecturing at the College of Fine Arts (COFA), UNSW, Sydney. Syed’s artwork utilises a variety of mediums and techniques to communicate complex political ideas. This includes print screening and the shadow play produced with dollar bills and razor blades. His political commentary tackles controversial topics such as the War on Terror, immigration, and Western attitudes towards the East. He participated in the Britto artists’ workshop and an artist residency at Cicada Press. He has also co-curated exhibitions, notably Michael Esson: A Survey of Drawing, Michael Kempson: A Survey of Prints, Aboriginal Dreams and Let’s Draw the Line in Karachi, Pakistan. As a designer he co-coordinated the Design Department at the University of Karachi as well as lectured there and at UCO in the United States.